November 22 is the perfect day to celebrate the National Cranberry Relish Day as Thanksgiving day is right around the corner and cranberry relish is commonly associated with Thanksgiving dinner. The most basic cranberry relish, also known as cranberry sauce or cranberry jelly, consists of cranberries boiled in sugar water. The berries need to be boiled until they pop and the mixture thickens. Cranberry relish may contain other ingredients such as orange zest and/or juice, cinnamon, ginger, port, or maple syrup. It is typically server with turkey for Thanksgiving or Christmas and is rarely eaten on other occasions. To celebrate the National Cranberry Relish Day, you may try out a new recipe – consider it a rehearsal before Thanksgiving dinner. 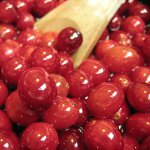 For example, you can make cranberry relish with pearl onions which is a combination of two classic turkey accompaniments: creamed pearl onions and cranberry sauce. Cook 21 pearl onions in a pot of boiling water for 2 minutes, then transfer them into a bowl of ice water. Drain onions, peel, and cut in half. Combine onions, 12 ounces fresh cranberries. 1/2 cup packed light-brown sugar, 1/4 cup water, 1/4 cup fresh orange juice, 1/4 cup red-wine vinegar, 1/4 tsp coarse salt, and 1/8 tsp crushed fennel seeds in a saucepan. Cover, and cook over the medium-low heat about 40 minutes.